The Jack and the Beanstalk slot machine is more than just a slot machine, because you will be immediately taken into account when opening the game in Oranje Casino. Jack is fleeing for the purple monster and the question is how that will turn out. In the meantime, a search for the treasure is taking place and during the game the treasure chest has a special meaning. There are a total of five reels, three rows and twenty paylines available for the game with a choice of different bet levels and various coin values. The value can be adjusted for every spin and the betting levels are also available, of which a total of ten are available. The Jack and the Beanstalk slot machine has several game features, of which the walking wild symbol is a part. The walking wild can appear on the screen, but will not just disappear again. For example, if a walking wild appears on the fourth roll, a re-spin follows, where the walking wild moves one step to the third roll. After that another re-spin follows and is moved to the second roll. This continues until the walking wild has arrived on the first roll of the game to remain there one more lap and then walk out of the screen. This wild symbol also appears regularly on the reels and can even appear on multiple reels at the same time, offering even more chances of winning combinations. The Jack and the Beanstalk logo is the wild symbol that will be instantly recognizable to every player. The treasure chest is an important symbol for winning free spins. The moment three of these treasure chests appear on the reels in a random position on the reels, ten free spins are awarded immediately. In free spin mode free spins can be won again if there are three treasure chests on the reels, after which there is another right to five free spins. In free spin mode you can also search for a treasure and for that offer the key symbols a solution. If a key is visible on the last reel, an additional game function becomes available. If there are three keys, there will be a stacked game with money bags and with six keys there will be a golden chicken that forms the stacked game. If there are nine keys then a golden harp will appear in the form of an expanding wild. While playing or before the game on the slot machine Jack and the Beanstalk starts, a choice can be made regarding the coin value and the bet level. The coin value can be set to the minimum amount of 0.01 euros with a choice of ten bet levels. If betting level one is then chosen, then a spin with this coin value costs 0.20 euros in total. However, a higher coin value and a higher bet level can also be chosen. The winning amount will of course depend on the chosen settings for a winning combination. 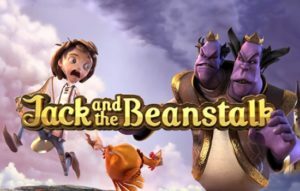 Tijdens het spelen of voor het spel op de gokkast Jack and the Beanstalk begint, kan er een keuze gemaakt worden voor wat betreft de muntwaarde en het inzetniveau. De muntwaarde kan op het minimale bedrag van 0,01 euro worden ingesteld met keuze uit tien inzetniveaus. Als er dan voor inzetniveau één wordt gekozen, dan kost een spin met deze muntwaarde in totaal 0,20 euro. Er kan echter ook voor een hogere muntwaarde en hoger inzetniveau worden gekozen. De hoogte van de winst zal bij een winnende combinatie uiteraard afhankelijk zijn van de gekozen instellingen.